Stuck in line? Need a break at work? Kids need something to play with? Well... why not jiggle some balls? Jiggle Balls is a "visualization" that will help you pass the time away! 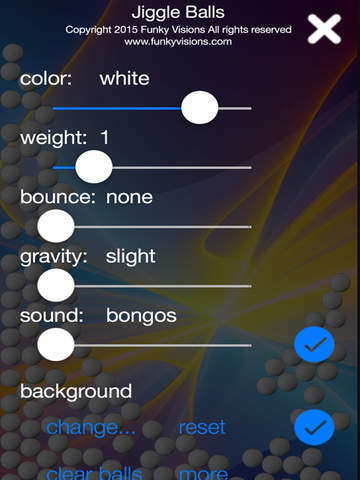 Simply tap on the screen to add new balls. Watch them as they fall "realistically" to the ground. Rotate your iPhone or iPod Touch and they'll tumble around the screen. Try the new Disruptor! Flick the balls and watch 'em fly! And how about those bongo bouncing noises when they hit the side walls? Jiggle Balls uses a revolutionary physics engine to simulate real world forces. You'll be amazed at how much fun it is to see how the balls react to your movements. In fact, put it on your center console in your car or take it with you on the train, subway, or schoolbus and watch the balls slam forward as you brake and then slide backwards as you accelerate. Try it around the corners too... but keep your eyes on the road! Jiggle Balls allows you to change many of the visuals. You can try different colored balls (try the groovy 70s psychedelic mode) or try different gravity schemes. Watch how the balls would respond if you were in space with no gravity. Or how about EXTREME gravity? SQUASH! And now you can try different weights on the balls, choose your own background from your photo album, and set the bounciness! Jiggle Balls will keep you and your kids entertained for hours. And if your boss walks in on you and you are "jiggling" balls, tell him to visit the App Store and try it himself! New features being added all the time! Watch the video at www.funkyvisions.com. - We were in a long line with my kids today and Jiggle Balls kept my 3 year old entertained until the line was over! - It's always the simple things that are the best. Great job lads. - This app is neat! I used it to help my science class learn about atoms. Your mobile device must have at least 582.59 KB of space to download and install Jiggle Balls app. Jiggle Balls is FREE to download. Hurry up to get this app for free! If you have any problems with installation or in-app purchase, found bugs, questions, comments about this application, you can visit the official website of Funky Visions Doug Davies at http://www.funkyvisions.com. Bug fixes. Better touch control. Completely rewritten to support ALL devices. Enjoy!